Sunnies. Dress. Chanel Ring. Clutch. Pantyhose. Booties. We are hosting a little Halloween party tomorrow and after that… It’s holiday season. I’ll be decorating the house for Christmas and shopping for Christmas gifts while I listen to my favorite holiday music. And with the hustle and bustle of the season come lots of holiday parties. 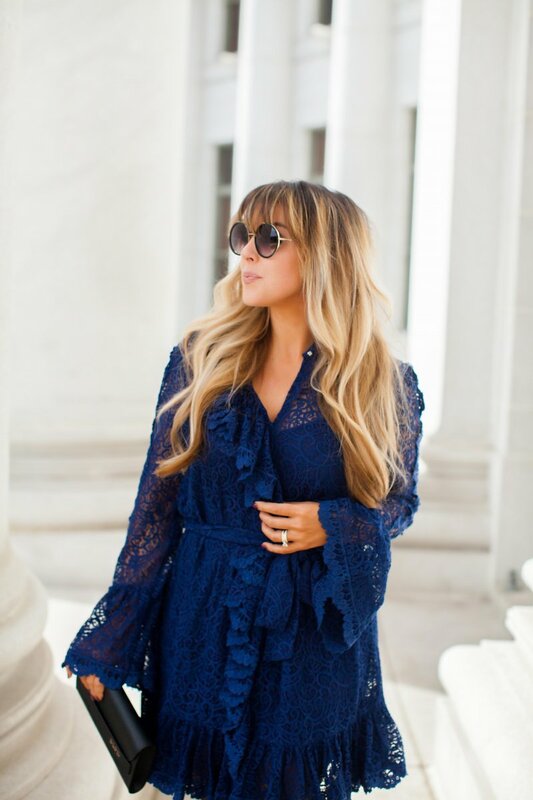 I fell in love with the bright blue color of this dress; the gorgeous lace, the flattering bell sleeves. I think it will be perfect for all those holiday parties to come. Fit Details: Dress runs true to size; fit is a bit on the loose side, so size down if you’d like a more fitted look. These booties are my favorite… I love the classic style and they go with absolutely everything. The blue lace is amazing! Black and blue always work out very well. A great combination. Thanks for sharing, Brittany.